Looking for a Boston Meeting Space Rental? Try a unique meeting space with the Boston skyline or Boston Harbor Islands as its backdrop. 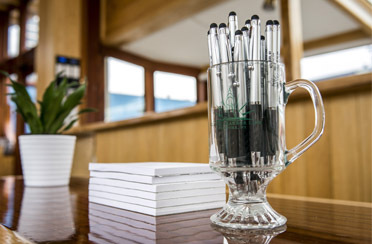 Yacht Northern Lights can facilitate meetings, seminars, sales conferences, networking events and client meetings for 20-135, offering audio visual services, internet, and more. There are many meeting spaces available in high rise buildings in the heart of the city, but why do the same old routine? 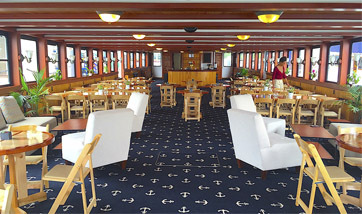 Step aboard a luxury yacht and host your meeting in style, elegance and professionalism on the water in Boston Harbor. Our Boston meeting space rental is a climate-controlled meeting event space that offers windows around the room to view the sites of Boston. Our staff can arrange the space to your liking, including theatre, U shape, classroom and boardroom arrangement. These yachts are also equipped with full outdoor decks for your clients or employees to go outside and take a breath of fresh air with a stunning view of the city and harbor islands. Classic Harbor Line’s meeting and event planning staff offers the attention, dedication and the expertise needed for planning your event. They will carefully orchestrate your event for you whether it be for an hour or the whole day. Our classic boat will cruise through Boston Harbor with grace and style as you conduct your meeting creating a elegant yet professional atmosphere. Cruise out into Boston Harbor and get inspired by our iconic buildings and monuments. These unique wonders will be the backdrop of your event and will be sure to impress and inspire. Northern Lights is the perfect venue to host your client or company meetings. Our professional sales staff will listen to your every need and accommodate them in order to plan the perfect event for you. Host your next company seminar aboard one of our classic yachts. The perfect venue for collaborative discussions and getting the team together for training. With this beautiful skyline as your back drop this seminar space is sure to inspire. Work with our professional planners to create the most memorable seminar in the history of your company. Get your sales team together for your annual sales conference aboard one of our classic yachts! This Boston event space is sure to dazzle, inspire and get the creative juices flowing! Host your next networking event aboard a classic yacht. Dazzle your group with the sites that Boston has to offer. Cruise by some of Boston’s most unique buildings, forts, and light houses. Breathtaking views and light commentary on the sites will help to inspire innovative ideas. Impress your clients and get down to business aboard one of our classic yachts. Build relationships and seal the deals aboard a classic sails or cruise with your clients. Take to the waters of Beantown as the sun beings to set and catch the cannon fire of the USS Constitution, which always aims to impress a crowd.